Antique candle holders decorative candle holder / pen holder inlay with natural semiprecious stones and its fully handmade. You can use it as a candle holder, pen-stand, flower vase etc. You can also gift it to someone special. 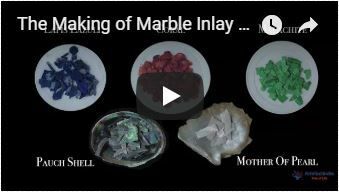 The semiprecious stones used to inlay in White Marble Candle Holder are Mother of Pearl and Abalone shell. You can see that how beautifully the floral design is made on the marble candle holder with the semiprecious stones. The white marble inlay candle holder is translucent with the light.